I opened up my internet last night and there it was, staring me in the face, uninvited I might add: The countdown until Christmas. Are you for real? Like I need a reminder every time I open the internet! It’s time to put the apple and pumpkin on the back burner and focus on all things chocolate, peppermint, eggnog and gingerbread. I’ve already shared a few of these desserts with you recently, and there is no looking back. 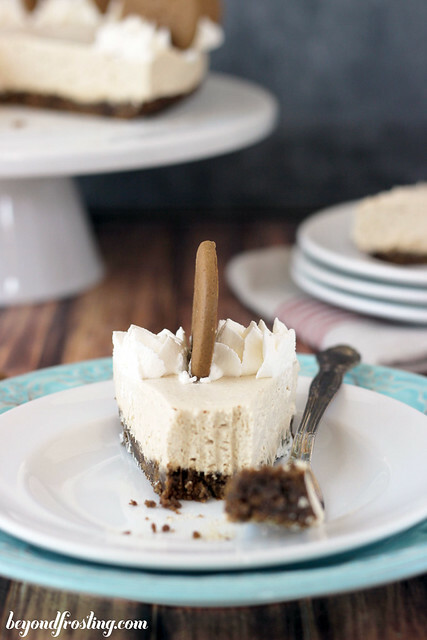 This No-Bake Gingerbread Cheesecake is the first gingerbread recipe I am sharing on my blog! As I get older, my taste buds adapt and I start enjoying things like gingerbread. It’s like a whole new me! I made a soft gingerbread cookie (recipe coming soon!) and all of the sudden, I was all GIVE ME MORE! I purchased my first bottle of molasses and went to work. For the crust, I used a store brought, firm gingersnap cookie. When it was ground up, the crumbs resembled the texture of graham crackers, which allowed me to add some butter and make a crust. The filling is made of your traditional no-bake cheesecake ingredients: cream cheese and Cool Whip. For this version, I’ve added some extra flavors: brown sugar, nutmeg, cinnamon and molasses. 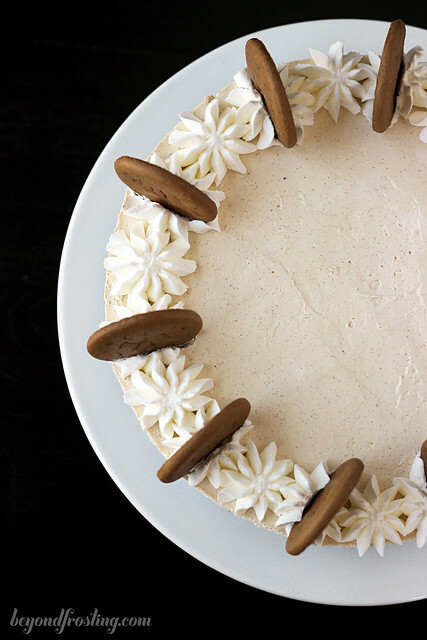 The result is a luscious and smooth gingerbread cheesecake. Which, by the way, is light enough not to feel guilty about eating a second slice! 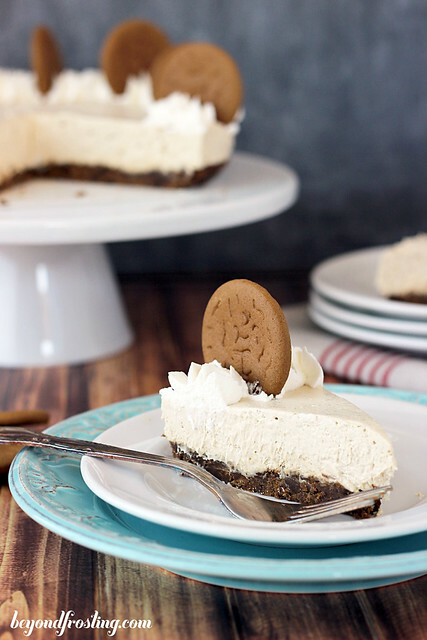 A fluffy gingerbread cheesecake filling atop a gingersnap crust. Use a food processor to grind gingersnap cookies into a fine crumb. Place in a microwave safe container. 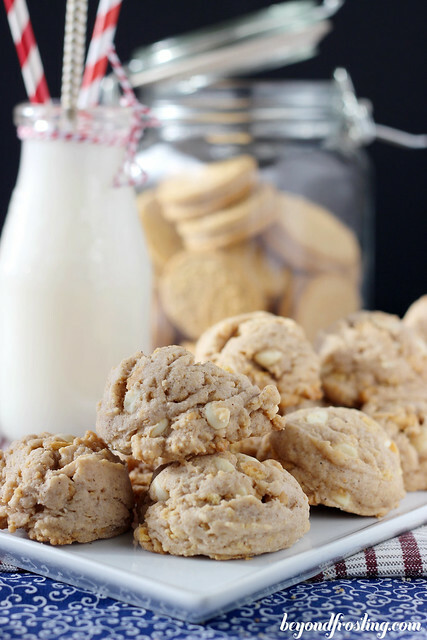 Add flour and mix to incorporate into cookie crumbs. 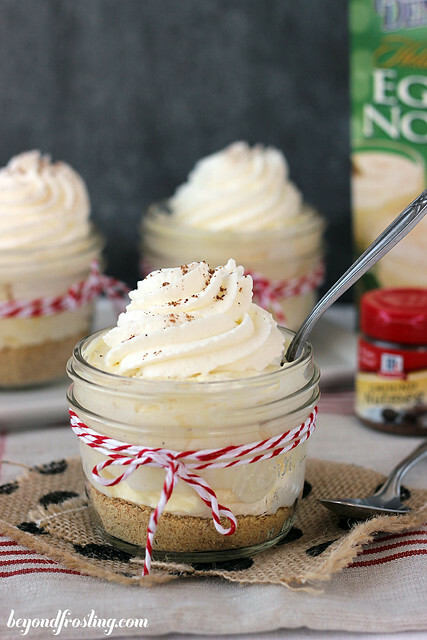 Place butter over gingersnap crumbs and microwave on high for 30-45 seconds at a time until melted. Stir to coat crumbs in butter until there are no dry crumbs. Line the bottom of your 9” spring form pan with parchment paper or aluminum foil. 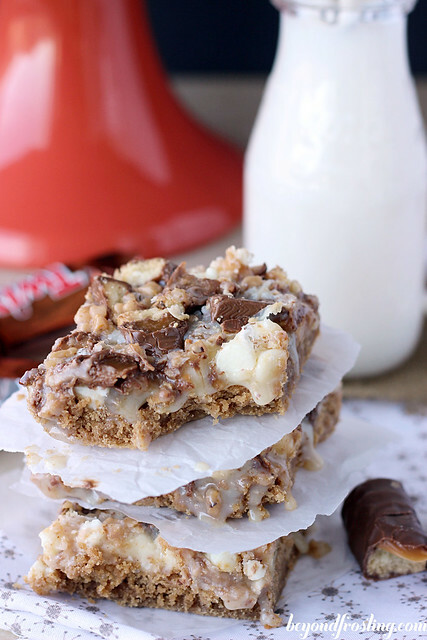 Place crumbs in the spring form pan. Press down crumbs into pan with a spatula or measuring cup. Remove cream cheese from fridge. If you have time, allow it to come to room temperature. Otherwise, place in the microwave for 15-20 seconds until soft but not melted. Beat on medium-high speed for 2 minutes until light and fluffy and free of any clumps. Add heavy whipping cream and beat for another 60 seconds. Scrape down sides of the bowl. Turn off mixer and add molasses. Incorporate molasses into the cream cheese by mixing on low speed. Add brown sugar, cinnamon and nutmeg. Mix until incorporated. Add Cool Whip and mix until the cream cheese mixture and Cool Whip are well combined. Pour filling into gingersnap crust. Prepare whipped cream before serving. Beat heavy whipping cream on medium high. Once bubbles start forming, add powdered sugar. Beat until stiff peak form. 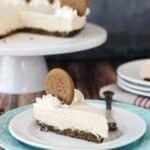 Pipe whipped cream along edges of the cheesecake. Garnish with additional gingersnap cookies. 30 – 40 minutes?????? Nearly had my house on fire!!!!! Is this the correct length of time? Hi Lynn, Unfortunately that is a typo, it’s 30-45 seconds until the butter is melted. I am so sorry! 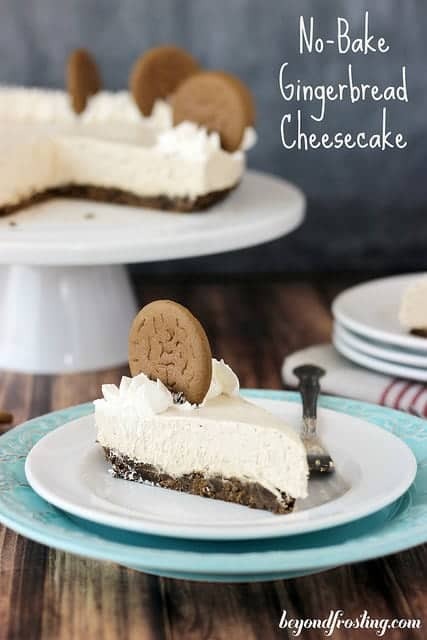 Everything about this cheesecake has me drooling!! I could seriously eat that entire thing myself! 😉 Pinned! Wow, this looks sensational. 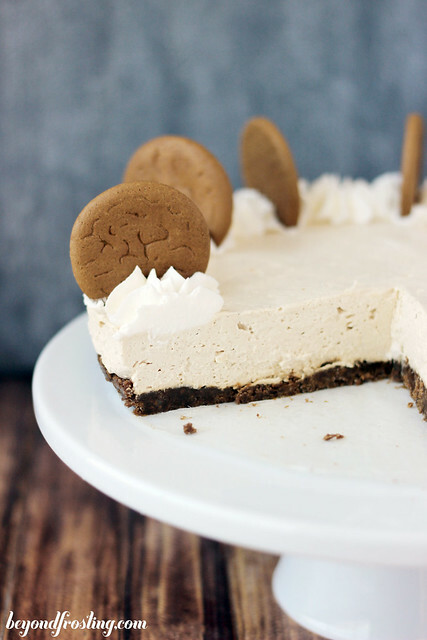 I love gingerbread flavors and this looks like a wonderful cheesecake. I bet this cheesecake is just DIVINE Julianne! I love this gingerbread version! I’m a gingerbread fiend, so this is right up my alley! Yum!